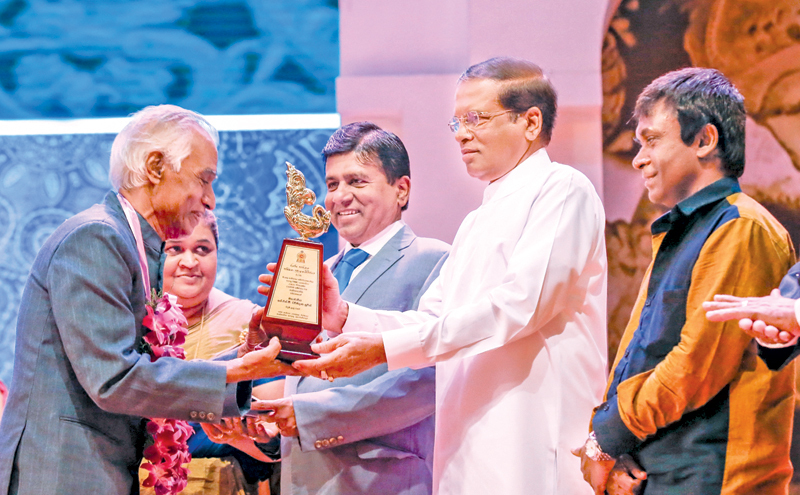 The State Literary Awards 2018, an occasion to give due recognition to authors who enrich the field of literature in Sri Lanka, was held under the patronage of President Maithripala Sirisena, at the BMICH, on Tuesday. Many authors received awards at this ceremony for their great contribution to the advancement of literature in Sri Lanka in 2017. Prof. K.N.O Dharmadasa, M. Ponnambalam and Prof. Gananath Obeyesekere were presented with the Sahityaratna Lifetime Award for their invaluable service towards the advancement of literature in the Sinhala, Tamil and English languages, by the President. Prof. Nalinika Obeysekere, daughter of Prof. Gananath Obeyesekere, received the award on behalf of her father. The awards, organised by the State Literary Advisory Board, Art Council of Sri Lanka, and Higher Education and Cultural Affairs Ministry, were held for the 61st time. The literary books which won awards were also presented to the President. Higher Education and Cultural Affairs Minister Wijeyedasa Rajapakshe, Ministry Secretary J.J. Rathnasiri, Cultural Affairs Director Anusha Gokula Fernando and Professor Samantha Herath of the State Literary Advisory Board were present at the event.